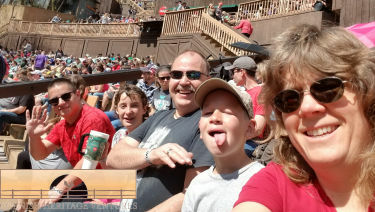 This weekend has been Young Christians Weekend at Silver Dollar City so we were there Friday night for Colton Dixon, yesterday afternoon for Britt Nicole and this morning for church with Matt Maher and others. The park was really crowded yesterday so we didn’t stay to ride any rides. Last year the weather was really cold but this year it was really warm. In fact I forgot to pack the suntan lotion and so Richard, who burns easily, had to go buy some! The temperature hit 81F. Wow! After the church service the park really emptied out so the kids were able to ride the rides they wanted without waiting too long. It has been a crazy week so it was really nice to have a slow, relaxing day today whilst enjoying the warmest day of the year so far. 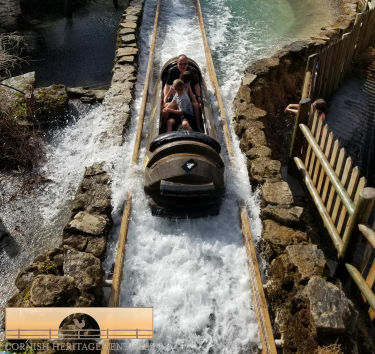 Richard, Hannah and Caleb even went on the American Plunge!